The wedding morning is here and I, your personal stylist will arrive in plenty of time to your home or hotel – wherever you are all getting ready. 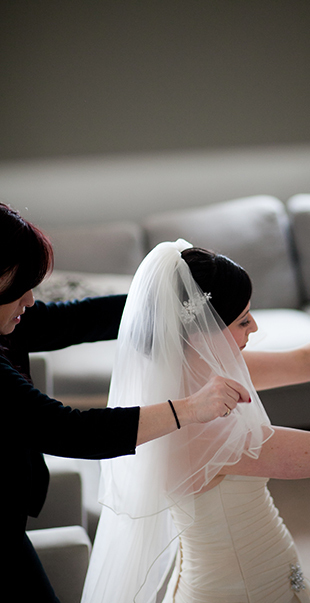 Between us we’ll schedule a list times for everyone having hair and make up appointments, so everything runs smoothly. I shall be there to style not only amazing hair and flawless make up, but keep you chilled and calm too!! My work can also entail pinning on flowers/buttonholes (yes i know thanks to working with many a florist what side they go on!) putting on hats, titivating and touching up right up to the ceremony time. An extra pair of steady hands if needed who knows how to lace up a corset and button up a wedding gown, attach and place your veil securely as the final finishing touch. When you look truly amazing with hair that lasts all day and make up that gives you the confidence to truly sparkle like the star you are, feeling radiant and calm, time to go and meet your groom and enjoy your day you beautiful bride! Feel very confident that I will ensure you have the wedding morning of your dreams and look as beautiful as you are, with me you will have a really, really good hair and make up day!! What day is more special day to spoil yourself with a professional hair stylist and make up artist than your own wedding day!